Read on after the cut for buying links and a sneak preview of “The Missing Mallard”! 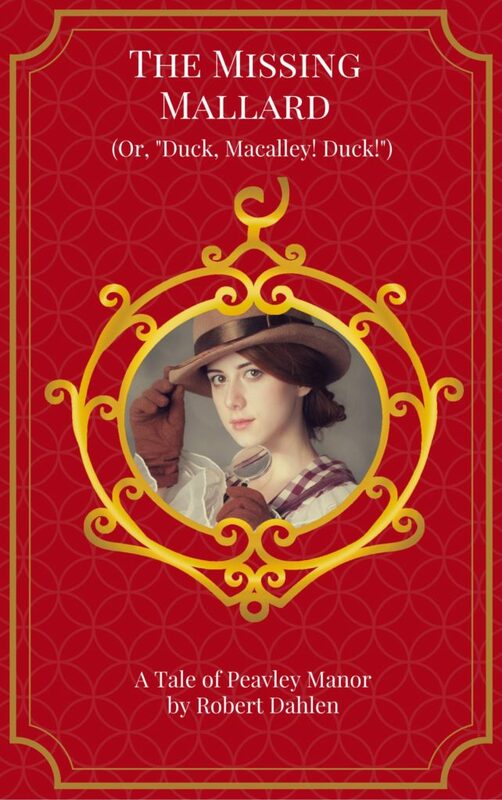 Buy “The Missing Mallard (Or, ‘Duck, Macalley! Duck!’)” at these stores! “The Missing Mallard” is also available through Amazon, iTunes and Kobo worldwide! No one is quite sure why the late Trenton Fotheringay had such a great affection for ducks. It does seem to the casual observer that his behavior was what could be expected from a man who would name his daughters Hesperia and Antigone. However, his obsession did not manifest until after they were born, which leads me to believe that it was a natural reaction to having to deal with two daughters who spent their days coming up with creative ways to hate one another. His obsession took the form of a collection. Trenton Fotheringay amassed an astonishing amount of duck figurines, art featuring ducks, books about ducks, housewares adorned with ducks in some manner, and even furniture shaped like ducks. It should come as no surprise to learn that he was a vegetarian. He kept his ever-expanding collection in his study, where he would often retreat following yet another daughterly quarrel. The elder Fotheringay left this mortal coil some years back, most likely with a sigh of relief. He exacted his revenge on his only heirs, the daughters, by leaving all his possessions – including his mansion, his investments, and his collection of duck paraphernalia – to the both of them, to be owned and administered jointly. As time went on, the daughters tried on numerous occasions to reach a rapprochement. All those attempts failed, almost always loudly and either caused by or resulting in much consumption of alcoholic beverages. Finally, Hesperia and Antigone agreed to hire a manager to handle their financial affairs. Her first task was to dispose of Trenton’s duck collection. This is what brought my valet Macalley to the Darbyfield library on viewing day. A distant cousin of his, Maccollin, had been hired to organize the sale. The manager had persuaded the Fotheringay sisters to take a vacation to the Tirnogs during this time, and had accompanied them to minimize their squabbling and prevent potential diplomatic incidents. Maccollin had asked Macalley for his assistance in preparing for the sale. Macalley had confided in me that “assistance” meant, in this case, that he would have to do a significant portion of the work. Even so, family was family, and more importantly, Macalley had set the condition that in return for his help, a portion of the proceeds were to go the Darbyfield Public Library Fund. It had not been the quietest of weeks for me. I had been busy with charity functions, a stubborn shower valve, and supervising the gardeners who had replanted the flowerbeds on the front lawn. I longed for nothing more than a few days of peace, a chance to catch up on my reading. Not having my reliable and versatile valet on hand did not seem peaceful. Still, I would dance a waltz with an unbathed goblin in a hailstorm to support our small but wonderful library, so I gave Macalley my blessing to assist Maccollin with the sale. The event was to take place over three days. Monday would involve a viewing at the library, to give the buyers a look at the scope and contents of the Fotheringay collection. The duck items would then be moved to G.H. Wollenhall’s, our local steakhouse, where most of them would be sold off on Tuesday. The choicest items were to be held for an auction on Wednesday. I had given Macalley a ride to the library, in part because I had an odd urge to see this collection for myself. I knew there were would be a great number of ducks for our perusal. What I hadn’t expected, or even attempted to imagine, was the sheer size of the crowd. Every spot within 500 yards of the library where one could park a motorcar or a carriage had been taken. Even after that discovery, I was slightly stunned when Macalley and I stepped into the library. There were humans from across the lands of the Crescent Sea and beyond, ogling every little item as if it were a 24-carat diamond, comparing notes and swapping stories. Elves examined eiders, trolls talked about teals, and a princely pixie in a scandalously revealing outfit pondered over a pintail. The sight of so many people was overwhelming enough, but then I beheld what they were scrutinizing with such eagerness. There was table after table filled with duck items. There were somewhat practical things such as bookends and teapots, decorated ties and sweaters, and whimsical pieces such as a portrait of Elfking Barkbirch with the head of a duck, which I suspect would make listening to his long-winded proclamations much more tolerable. One shelf was filled with a selection of books and other duckish paper ephemera, and a large glass display case held some well-crafted if odd-looking jewelry. Several buyers were carefully examining an armchair with a duck’s head mounted on the back. A man with a truly impressive set of graying muttonchops glanced up from a candelabra. “You’re not a fan of these feathered marvels?” he said to me. “I have no strong opinion either way,” I replied neutrally. “Or perhaps you mean, eider way!” The muttonchopped man chuckled. “Alice Peavley.” I shook his hand. “From Peavley Manor?” Storch smiled. “That must be Macalley, then!” Macalley nodded quietly. “They have?” Out of politeness, I fought back the urge to raise an eyebrow. “Is that so?” I said, again with a politeness that I must admit was slightly forced. I was not in the habit of feeding our feathered friends. I will not speak in mixed company of the last time I tried, and what those blasted birds did to my second best pair of boots. Storch paused and stared at a painting of a weary looking woman of early middle age. She sat in a chair by a pond, surrounded by ducks. “An interesting choice of subject matter,” I observed. “Ah.” I found myself unable to blame Ethelind, but I opted not to share that thought aloud. “Retract that at once, Glitterglim, you scoundrel!” We turned our attention away from the painting and towards the far end of the library. The speaker, a rather short woman with waist-length braided blonde hair and a red pantsuit, was pointing a finger at the pixie we had seen earlier. Peirea swept her hand towards the back wall, where a figure was being displayed in a glass case set upon a pedestal. It was a small golden duck, lovingly detailed, with miniscule black gems for eyes. It might have been a trick of the afternoon sun, but it seemed to me to be glowing. “I’ll fry you like a rasher of bacon!” Peirea shouted, fire in her eyes. © 2017 Robert Dahlen. All rights reserved, except for those protected by “fair use” laws in your country of residence.